On the 31st, in a phone interview with Newsen, Playful Kiss OST's production team Sponge Entertainment Lee Sang Mok nim revealed, "Kim Hyun Joong recorded not long ago for the male lead's solo theme, it's a sweet ballad track". In addition, "Because it's the theme of the male lead himself, instead of having others sing the song, it will be better if Kim Hyun Joong sings it himself, and this was recommended by Hwang In Roi PD nim, to which Kim Hyun Joong agreed readily". 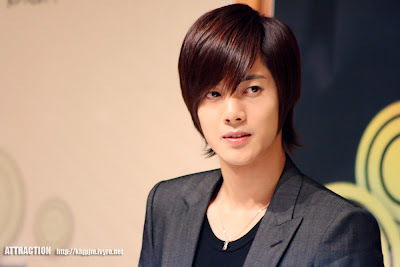 Not just that, "HyunJoong doesn't have any free time because of his very tight schedules that nests through nights, but even if he may be very tired, he still gave up his sleep and eventually finished recording for the song safely", "Instead, I encouraged him that concentration in the morning will achieve better results", showing his praise for HyunJoong. "The moment news about Kim Hyun Joong participating in the OST came out, calls from media in Japan and Taiwan surged in almost immediately, and suddenly, we just realized how Kim Hyun Joong's popularity was so real", he also expressed. This solo track of HyunJoong's will be released mid of next week. I actually expected that Leader will song an OST for his new drama. I mean, that's kind of a given already. He sang a few for Boys Over Flowers, as well as his brothers in SS501. I hope that this time around, SS501 will also sing one or two songs for the OST. That would be fab! Can't wait to hear the songs! I'm sure they will be great!